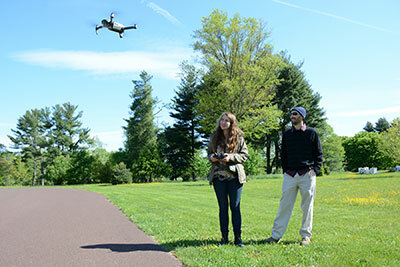 PHILADELPHIA, PA Spring 2017—On a beautiful morning in early May, two Penn students—Kristen Pearson, a junior majoring in Classics, and Lauren Aguilar, a dual degree Master’s student in Architecture and Historic Preservation at the School of Design—were out at the Morris Arboretum’s Bloomfield Farm, engaged in flight training. Their aircraft: a new DJI Mavic Pro drone. Kristen and Lauren were among 13 students, graduate and undergraduate, from multiple disciplines, taking Spatial Analysis of the Past, a new course taught by Dr. Peter J. Cobb, Kowalski Family Teaching Specialist for Digital Archaeology in the Penn Museum’s Center for the Analysis of Archaeological Materials (CAAM). Throughout the semester-long course, students gained experience creating, gathering, and manipulating 2d and 3d spatial datasets. They practiced using a variety of analytical techniques on data to draw archaeological and historical conclusions. They worked with numerous tools, including relational databases, geographical information systems (GIS), global navigation satellite systems (GNSS), raster image processing, photogrammetry, and 3d spatial modeling software. One great way to gather spatial data is by flying an Unmanned Aerial Vehicle (aka UAV or drone). Earlier in the semester, the students had a chance to practice with a lightweight drone, the type purchased for hobby use, in the Museum’s inner courtyard. 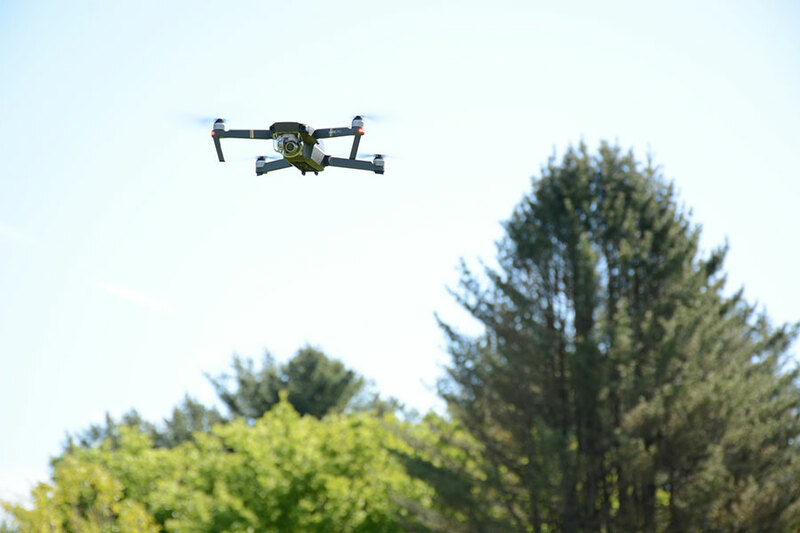 At less than a tenth the cost of professional equipment, these drones are good for first time pilots getting a feel for the job, but they could be hard to manipulate. “We started with three practice drones at the beginning of the semester; now we only have one that’s still flying,” Dr. Cobb noted. 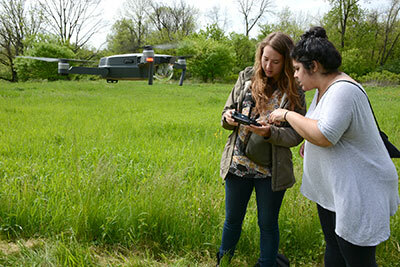 While students learn to employ a whole tool set of technologies in the course, Dr. Cobb acknowledged that flying the drones was especially fun. Via aerial photographs and video, drones collect the rich sets of data, and the multiplicity of angles, that provide the researcher with a more holistic view of a given landscape. A Classics major with minors in CAAM archaeological science and linguistics, Kristen has a special research interest: an avid horse rider growing up in Norwich, Vermont, she wants to study horsemanship in Mongolia—something she’ll be doing this summer as she travels to Mongolia to work on an excavation. “I’m hoping to apply what I learn about modern horsemanship in that (Central Asian) landscape to looking at the impact of horse domestication in the Bronze and Iron Ages.” Her Penn advisor is Dr. Katherine Moore, CAAM’s Mainwaring Teaching Specialist for Archaeozoology. Kristen has had access to a strong collection of comparative domesticated animal bones, including horse bones, in the CAAM zooarchaeology lab. As a dual Master’s degree major in Architecture and Historic Preservation in the School of Design, Lauren Aguilar, who hails from Temecula, California, has interests and a path that lead in a different direction. Even so, the skills she learned in this course are proving surprisingly useful. 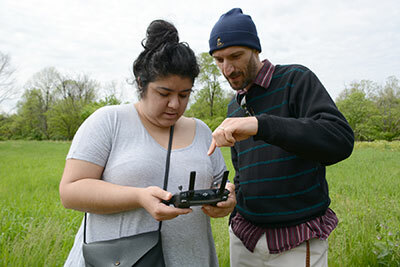 Though she was initially tentative about learning to fly the drone, Lauren’s Arboretum flight will not be her last: she will be on a team flying drones to survey building conditions in her summer job with Historic Building Architects of Trenton, NJ in the early summer. In July, she leaves for the archaeological site of Aphrodisias, Turkey, where she’ll be conducting a field survey—and finding herself again working with drones. The Center for the Analysis of Archaeological Materials (CAAM), a joint endeavor between the University of Pennsylvania’s School of Arts and Sciences and the Penn Museum, completed its third full academic year of classes in May 2017. In the fall of 2014, CAAM offered its first class, ANTH 148 Food and Fire: Archaeology in the Laboratory, a freshman seminar, to 14 students. The popular fall course now draws more than 50 undergraduates who get an early introduction to the Penn Museum’s international collections and research activities. CAAM offers the facilities, materials, equipment, and expert personnel to teach and mentor Penn students in a range of scientific techniques crucial to archaeologists and other scholars who seek to interpret the past in an interdisciplinary context which links the natural sciences, the social sciences and the humanities. The digital archaeology specialty was added in the fall of 2016. In fall 2017, Dr. Cobb teaches a new class to introduce undergraduate students to 3d modeling and data management of archaeological objects: The Material Past in a Digital World. 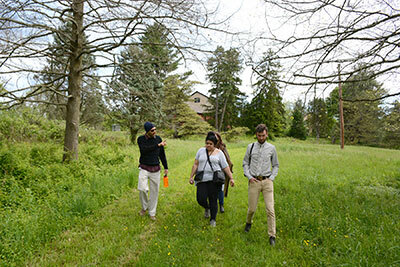 Today, CAAM is staffed by Teaching Specialists with expertise in ceramics, digital archaeology, archaeobotany, archaeozoology, skeletal analysis, lithics, archaeometallurgy, and conservation offering four or five in-depth, hands on courses at the graduate and undergraduate level, as well as a Minor in Archaeological Sciences. Information about the CAAM program, and Penn student opportunities for learning in a Museum environment, are online: www.penn.museum/caam.